Medical specialists from the U.S. Army Europe Command Surgeon's Office and Regional Health Command Europe recently visited Kiev Military Hospital in Ukraine to partner with Ukrainian Armed Forces surgeons for a surgical partnership initiative. 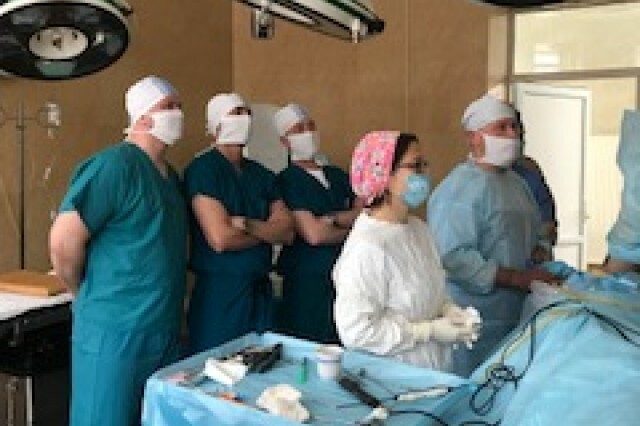 The initiative focused on providing "over the shoulder" academic exchanges between U.S. and Ukrainian surgeons on individual cases, both in clinical and classroom settings, according to Capt. Andrey Sidorenko, USAREUR OCSURG Global Health Engagement action officer. The visit gave U.S. surgeons an opportunity to familiarize their Ukrainian counterparts on the integration of multidisciplinary care. Additionally, Ukrainian providers were able to demonstrate clinical innovations developed during the current conflict to enhance U.S. provider's knowledge and skills in management of combat trauma. "During the first day of the mission we visited post-operative and pre-operative wounded Ukrainian Soldiers in order to get familiar with the typical injuries treated by the orthopedic/trauma department," said Sidorenko. Following that, the U.S. team was given the opportunity to attend and observe arthroscopic shoulder reconstruction surgeon, which was performed by Ukrainian orthopedic surgeon, Col. Vladimir Bondarenko. They also spent time with their Ukrainian partners and gave a presentation on an "innovative method of controlling abdominal and pelvic hemorrhage by the Forward Surgical Teams in austere setting." During the three-day visit, U.S. and Ukrainian Soldiers developed and strengthened their relationships and also took time to discuss future partnership ideas. "Overall, the exchange of presentations was remarkably well received," said Sidorenko. "Meetings with senior leaders were productive as well and all were open to future engagements with the goal of learning from each other's experiences in the treatment of combat trauma." This visit to Ukraine is not the first of its kind. In February, a team consisting of six medical specialists from USAREUR and RHCE embedded with a Canadian medical team organized by the Canadian-Ukrainian Foundation. 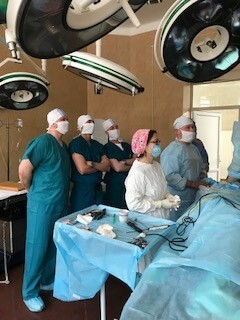 The group partnered with Ukrainian Army Surgeons at the Kiev Military Hospital for a Surgical Master Class focusing on Facial Reconstructive Surgery and Hand Surgery. During that visit, the teams saw more than 80 patients, and performed surgery on approximately 40 with complicated injuries. USAREUR and RHCE teams are also working with the Ukrainian Armed Forces to offer leadership courses. In June, a team visited Ukraine to host a basic leadership course for the some of the country's junior medical officers. The focus of the week-long course was Army values, leadership, doctrine and troop leading procedures. Support goes beyond the operating room and classroom setting as well. Earlier this month, USAREUR presented 40 military ambulances to the Ukrainian Ministry of Defense during a Ukrainian Armed Forces Day Ceremony at the Yavoriv Combat Training Center, Ukraine. The ambulances, which are part of the train-and-equip program with the Ukraine, enhance Ukraine's medical evacuation capability. As the most recent partnership event concluded, the two militaries established an agreement for quarterly engagements. This will include additional exchange of clinical and operational case reports with additional participation of students from the Ukraine military medical academy. "This visit, we saw the relationship between U.S. and Ukrainian partners grow and an eager interest for the next engagement," Sidorenko said. "We have gained trust and built the foundation for further interaction and observation with General Surgery, Orthopedic Surgery, and Rehabilitation physicians."